“Ricky Nelson Remembered” Starring Matthew & Gunnar Nelson is one of the most favorite music shows in Branson which features the hit songs of Ricky Nelson including “Hello Mary Lou”, “Travelin’ Man”, “Garden Party”. The identical twins, Matthew & Gunner performed the music of their late father Ricky Nelson and includes never before seen big screen video footage of the Nelson family with interviews from celebrities influenced by Ricky Nelson. This music show in Branson appeals to a wide audience and celebrates the life of America’s original ‘Teen Idol’. This year 2017 marks the 32nd anniversary of Ricky Nelson’s passing in a tragic plane crash on New Year’s Eve. The stars of the show twins Matthew and Gunnar Nelson follow the footsteps of their father Rock’n’Roll Hall of Famer Ricky Nelson, son of ‘50s TV icons Ozzie & Harriet Nelson. When the twins hit #1 on the Billboard with their rock band NELSON, their self-penned #1 mega hit “Can’t Live Without Your Love & Affection,” the Nelson family was listed in the Guinness Book of World Records as the only family in entertainment history with three generations of #1 hitmakers. With the band Nelson, Matthew and Gunnar got five Top 40 Billboard hits, four #1 MTV videos and have sold more than 6.5 million albums worldwide. 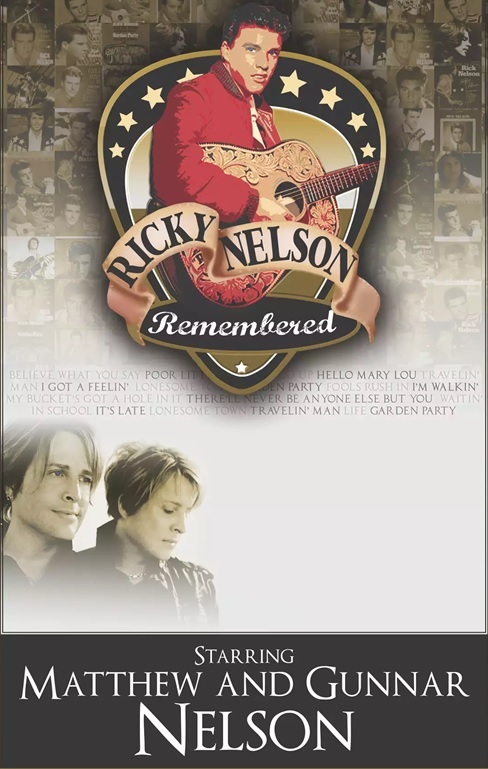 The Ricky Nelson Remembered music show in Branson features hit songs like “Hello Mary Lou,” “Poor Little Fool,” “Travelin’ Man,” “I’m Walkin’,” “I Gotta Feeling,” “Teenage Idol,” “Garden Party” and many more. This music show in Branson showcases the life of Ricky Nelson with never-seen-before interviews from artists he influenced, including Paul McCartney and Chris Isaak. Matthew and Gunnar’s show performance in this musical event is full of laughter and is enjoyed much by all audiences. As an icon of American entertainment in the 1950s, Ricky Nelson is an unforgettable teen idol of great music during his time. The father of twin brothers Matthew and Gunner Nelson that they will always honor. Join the twins soon in Branson for “Ricky Nelson Remember” music show that treats audiences not only to Ricky’s classic hits but Nelson family’s movies, interviews, and even more that can’t be seen anywhere but here in Branson. Returning to Branson this year 2017 in April, “Ricky Nelson Remembered” is sure to be a hit show with unforgettable musical performances of Matthew & Gunnar Nelson. The twin sons of television and music icon of the 50s, Ricky Nelson, they set aside their own rock music careers to assemble a tour in honor of their legendary father, an accomplished artists with a star on the Hollywood Walk of Fame, a place in the Rock and Roll Hall of Fame, and a Grammy Award. Great singers in their own right, Matthew and Gunner on “Ricky Nelson Remembered” music show in Branson, they are proud to perform with the music created by their legendary father, Ricky Nelson and certainly have the kind of heart and passion that can only come from the family.